Email has been around for a lot longer than Facebook has. A lot of people believe that it’s dying out, but that simply isn’t true. It has been growing, and it is expected to continue to grow. Messenger, WeChat, LINE, and all the other messaging applications will never really be able to replace email. Email is more popular than team chat. Well, maybe there’s something that will eventually come along to put an end to the era. But what we know is that for now, surely, email is a necessary method of professional communication. In business communication, small tweaks in your email can make a big difference. Since you use email to communicate with employees, suppliers, and clients alike, it’s important that you put your best foot forward on email. After all, this may be the first impression people have of you. With a professional email signature, you are telling people who you are, where you’re from, and how they can contact you. You’re making it visually attractive so people’s eyes are drawn to it. If you do it well, it may even help you with your sales! Before any of that, you’ve got to start with the basics. How do you put together a professional email signature that will blow others away? Let’s take a look. Your email signature shouldn’t be another email in itself. All you need is your name, job title, company, contact information, and occasionally another piece of relevant information. It may take a couple lines, but it definitely shouldn’t take a whole paragraph. If it’s too long and complicated, people will skip it altogether. It’s meant to add value to your email, not to distract from the main content. Ensure that your email signature is clear and concise, containing all the important details. This is no place for extra fluff. 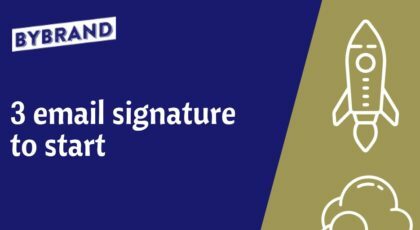 Bybrand has a free hand signature editor with no forms to fill. See this 60 second quick preview of editor. You want other people to recognize your company from your email signature. This is why it’s so important to stay consistent with your brand. Your typeface, colors, images, icons, and even format should be consistent to the brand. Whether you view this as a good thing or a bad thing, just know that it’s an important thing. It builds brand recognition and can go a long way to building trust. 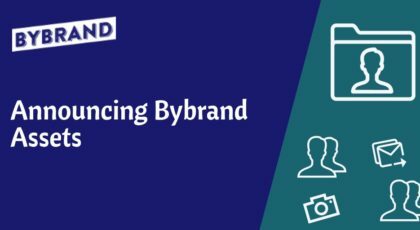 Bybrand has the signature clone feature, to create identical email signatures for all employees. This isn’t a necessity for every single email signature, but many people find headshots wonderful for making their email signatures a little bit more personal. This is especially true in a business relationship where you are trying to build trust. Being able to put a face to the name goes a long way. Of course, it’s important to make sure your photo is professional. Your headshot should be of high-quality and taken in good lighting. The professionality may depend on the industry – a law firm may want something a lot more professional while an online fitness coach may choose something a little bit more casual. Just make sure it is a match for your industry and it is helping to add a bit of a personal touch to the professionalism of an email signature. A mistake that a lot of amateurs make is add too many colors to their email signatures. You may love purple and green, but they aren’t going to look great on your accountancy email signature. When it comes to color, less is usually more. If you’re in the creative industry, you may be able to get away with being a little more rebellious, but for most traditional industries, be subtle and stick with the brand colors. Read more The importance of defining color for your brand. This is an example of email signature that might look good for a professional. A block of colors to highlight your services. The guidelines for fonts are pretty similar to that of colors. Don’t go too wild. There are very few circumstances that warrant you to use more than two fonts on a professional email signature, and it’s almost always a better idea to simplify. Keep legibility in mind, and make sure the style of the font fits with your industry. Note the size as well – 10 to 12 points are usually safe. That is, unless it’s a legal disclaimer that you can make smaller. As always, try to stick with the brand typeface. Remember that using special fonts does not work with email signatures. Typically email signatures are opened on dozens of different operating systems, and the system may not recognize its fonts. Disclaimer: does it Influence your business protection?